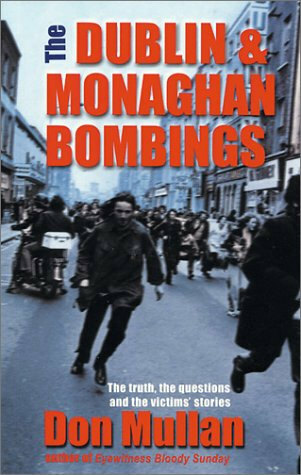 The Dublin and Monaghan Bombings is Don Mullan’s 2nd major best-selling investigative book. Following the impact of ‘Eyewitness Bloody Sunday’, Irish Artist, Robert Ballagh, suggested to Don Mullan that he consider doing a book on the 1974 Dublin and Monaghan Bombings, which remain the biggest unsolved mass murder case in the history of the Irish Republic. Ballagh had previously invited Mullan to collaborate with him on an illustrated history of Ireland for the Club House, Druids Glen, Newtownmountkennedy, Co. Wicklow, which Mullan wrote and called, ‘IRELAND: 5000 years in 20 minutes’. After some consideration, Mullan launched himself into two years of research, including a determination to tell the story of each of the 33 people who had been murdered across the Irish capital and the border town of Monaghan on 17 May 1974. Mullan was particularly impressed by Angela and Denise O’Neill who lost their father, Edward, and whose two younger brothers, Edward and Billy, were seriously wounded in the first of the three bombs, which exploded on Parnell Street. The two sisters founded the organisation Justice for the Forgotten in 1996 with the active support of their mother, Martha, who was pregnant at the time of the attack and whose baby daughter, Martha, was stillborn three months later. At their invitation, and that of veteran campaigner, Nora Comiskey, Mullan joined the Justice for the Forgotten Campaign. Mullan’s involvement provided impetus to the Justice for the Forgotten Campaign and he played a key role in achieving the first ever meeting of the victims with an Irish Taoiseach. On 22 April 1999 he accompanied some 40 relatives of the deceased, and wounded, to a meeting at Government Buildings to meet with the newly elected Taoiseach, Bertie Ahern TD, whom Mullan had worked closely with in the lead up to the 2nd Bloody Sunday Inquiry. At the meeting, Mr Ahern asked the Campaign to work with his officials to explore a way forward. After several meetings with Government officials, and the Irish Attorney General, Michael McDowell, the campaign eventually agreed to cooperate with an Independent Commission of Inquiry, robustly rejecting the offer of a Private Inquiry. Mullan’s book: ‘The Dublin and Monaghan Bombings – The Truth, The Stories and the Questions’was another bestseller and was reviewed on RTE One’s ‘The View’ whose panel agreed Mullan had made a compelling case for a Public Inquiry. It sensitively recounted the stories of all of the murdered and many of the wounded, including Italian restaurant owner, Antonio Magliocco (37); and Simone Chetrit (30) a French Jewish survivor of the Holocaust who had been born in 1944 to a mother hidden by Catholic nuns during the Nazi occupation of Paris. With the support of Congressman Joe Crowley, Mullan met at Cape Cod, Massachusetts, Ed Komac, a former US Military Ordinance expert who, on examining material Mullan brought to him, concluded that the synchronicity and efficiency of all three explosions in Dublin pointed to a military operation beyond the capabilities of Loyalist paramilitaries at the time. Komac’s conclusion added weight to the long standing suspicion that while Loyalist paramilitaries delivered the bombs to Dublin, the bombs had been assembled with the collusion of British Military personnel. After the resignation of key members of the Justice for the Forgotten Campaign, including the founders, Denise and Angela O’Neill, removed from the Executive Committee by a secret ballot, Mullan also resigned. The O’Neill family and other key families asked Mullan to introduce them to Derry solicitor, Desmond J. Doherty, who was instructing Michael Mansfield QC in the Bloody Sunday Inquiry and the Omagh Bombing Inquests. Doherty continues to represent those families. Eventually retired High Court Judge, Mr Justice Henry Barron, conducted an investigation into the bombings which Mullan assisted. However, there was confusion and shock when Barron stated in the introduction of his Report that he had been asked to conduct a ‘Private Inquiry’. On 19 January 2004 Mullan submitted to an Oireachtas sub-committee, set up to examine the Barron Report, a detailed 24 page document entitled “A Trust Betrayed – Again? – Submission to the Sub-Committee on the Barron Report”. He declined an invitation by the Oireachtas Committee to appear before it on the basis that it did not have the powers of compellability which only a properly constituted Public Inquiry would have. On the occasion of the 40th anniversary of the Dublin and Monaghan Bombings, 2014, Don Mullan was interviewed by RTE journalist, Miriam O’Callaghan, on her popular Sunday morning show, ‘Sunday with Miriam”.